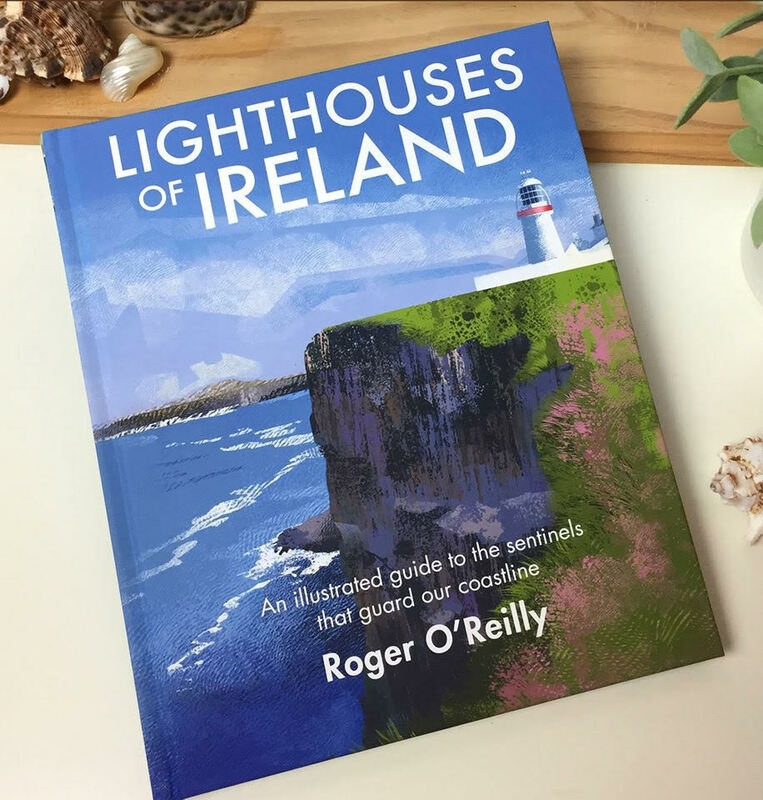 Its been quite a while since I bagged what my wife would term a real, Irish lighthouse. 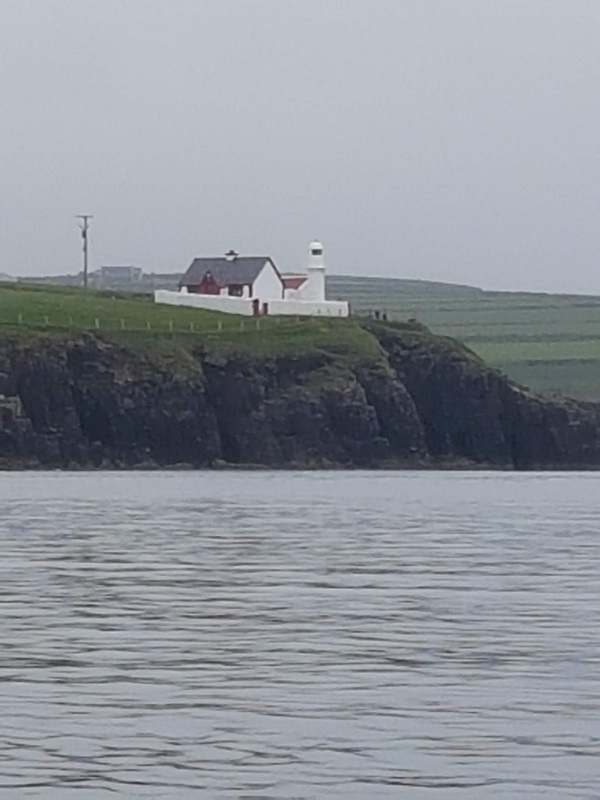 The lighthouse at the eastern entrance to Dingle Bay is certainly that, though it is not operated by the Commissioner of Irish Lights. Actually, we got photos of it in two ways - firstly from the water and secondly from the land. We tried our hand at rowing a naomhog (little saint), similar to a currach, except long and slender. There is a place on Dingle marina where you can try your hand at it. The boats are easily rowed, fly through the water and the day we did it was as calm as sea as you're likely to get. 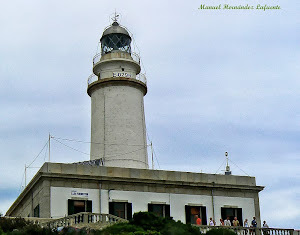 Anyway, we rowed almost to the mouth of the harbour near the lighthouse and I managed to get the first two photographs here. The second set of photographs from land can be reached by a path all the way from Dingle, if you have the time, or from a quarter of a mile away, if you haven't. A beautiful spot and even Fungi, the dolphin, put in an appearance for us. We took the road out of Dingle heading for Annascaul. Passing the Dingle Skellig Hotel on the right hand side, about 1.3 kms further on there is a very small turn to the right, on a right hand bend, that almost doubles back on itself. This will bring you to the shore, where there's parking for about 5 cars. From there it is but a 10 minute walk past Hussey's Folly to the lighthouse. Alternatively, if you miss this turn, take the next right turn a few hundred yards further on. 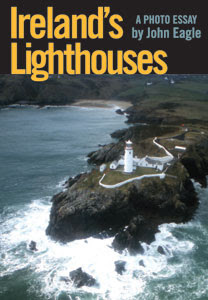 This will also bring you to the coast but you'll approach the lighthouse from the opposite direction. Okay, not the most visually stimulating of navigational lights but I include it here as a blatant plug for Ballydavid on the eastern side of Smerwick Bay, on the northern side of the Dinle peninsula. Ballydavid is quite off the beaten track and is very small but has a lot going for it, including a lovely safe sandy beach, a very picturesque pier and harbour, great community spirit and a couple of beachfront pubs serving creamy pints of Guinness. Mount Brandon, its top almost permanently shrouded in mist, in the background. 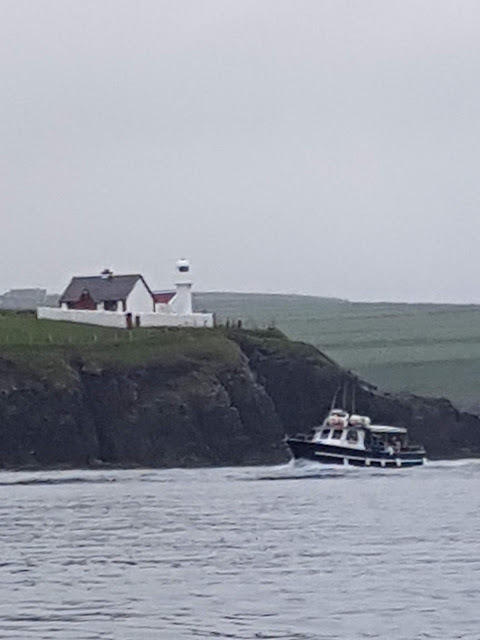 A few days walking holiday down on the Dingle peninsula in early June and I managed to inveigle my travelling companions, Aiden and Brenda, to climb Carhoo Hill near the western entrance of Dingle harbour to reach Eask Tower. We had been able to see the edifice on top of the hill from back at the Conor Pass but my attempts to describe the structure met with puzzlement. "Its built of solid stone and its rounded at the top kind of like a silo and it has an arm sticking out...." "So its a statue" "No, its a beacon." When we finally got there, Brenda described it much more eloquently as "a big stone Dalek." It can be reached by branching left from the Ventry Road at Ballymore, 4km west of Dingle. Unfortunately it isn't signposted, so you have to hope you have the right road. You don't see the tower for at least a kilometer but when you do, you should be heading for the left of it. The path to the top is well signposted and there are spaces for four or five cars. The path up is over private property and costs €2 per person. A very nice and chatty lady came out to meet us. I have read that if she doesn't come out and you don't put money in the honesty box, she'll be out after you! The path up is easily followed and through fields of sheep. Takes about an hour up and down, including time for photos and view-admiring. Its a bit windy up on top. Dingle is a blind harbour, meaning the entrance, which is quite small, was not readily visible to ships and boats arriving from the Atlantic. The wooden hand pointing from the Tower, guides the boats to their destination. Actually the arm itself looks a lot smaller than it did in some of the photographs I have seen, leading me to wonder if it was a casualty of one of the storms of the last few years. The Tower is of solid stone. The building of it on Carhoo (Ceathru) hill, 600 feet above sea level, provided work during the Great Famine of the late 1840s at the instigation of Reverend Charles Gayer, Leader of the Protestants, in an attempt to win converts. Twenty-seven feet was its original height, but at the turn of the century, the old hand was removed and an extra thirteen feet of stone was added to its height. A new hand was placed, roughly at the beginning of the extension. A World War Two lookout station stands beside it and the views from the top on a sunny day are stunning. The Towereen Bán, at Reenbeg Point on the western side of the entrance to Dingle harbour, has been crumbling for some years and is in danger of total collapse. Like Eask Tower, this stone tower was built as a famine relief work in 1847, under the supervision of the local Protestant curate, the Rev Charles Gayer. A natural stone arch formed a bridge between the tower and the cliffs at Reenbeg but that collapsed during a storm in January,1981. 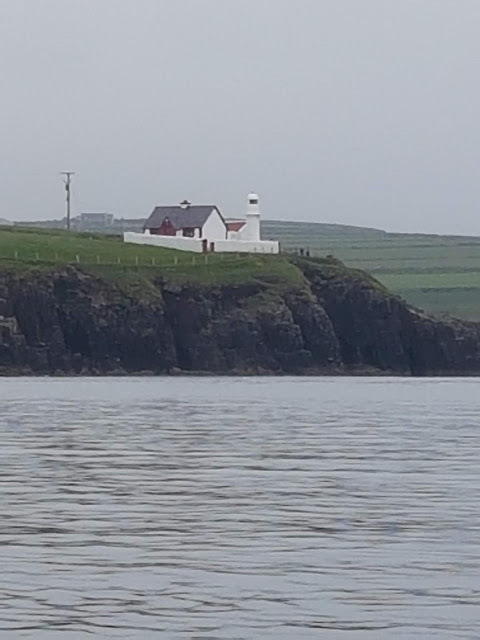 In recent years the tower has been painted white, by the local sailing club, as one of the markers at the finishing point of the Dunlaoire/Dingle yacht race. I found this old postcard on my computer. I have no idea whence it came. 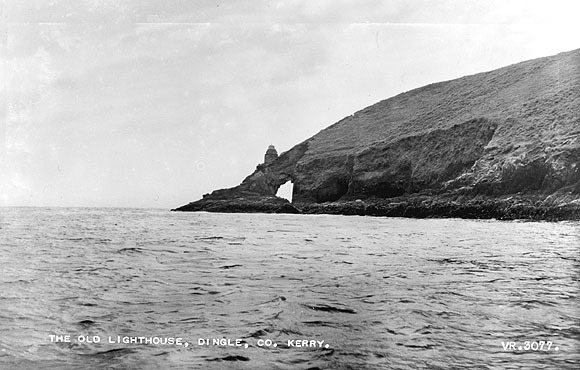 It purports to show 'The Old Lighthouse,' Dingle but it looks as though it is the Towereen Ban in its heyday. The arch, clearly visible has now gone. 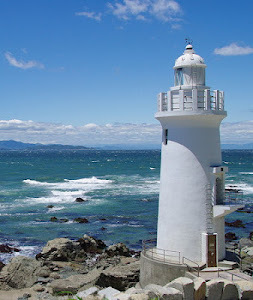 Of course, this 'lighthouse' never had a light. On the eastern headland that marks the entrance to Dingle harbour, Beenbawn Head, stands a pile of stones that once was another Dalek. It has long since been reduced to a pile of stones, many of which have been removed and doubtless feature in local walls and houses! This rather long distance shot was as near as we got.